An Open Carrier is typically similar to those which you see bringing cars to a dealership, and they range in size and capacity. The cars are open to the weather conditions and other road conditions. Enclosed Carriers (which also vary in size and capacity) prevent weather and other conditions from reaching the automobile. 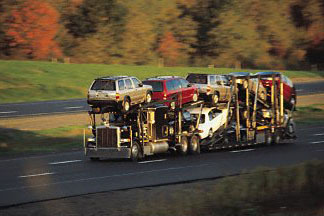 Enclosed carriers, while not reserved for custom and luxurious cars, are usually recommended for them. Enclosed carriers are usually a significantly higher price.